← YNPN RVA’s Banter, Brew, & Headshots for You! YNPN RVA is excited to launch a new monthly opportunity for members to engage in a diverse body of ideas, spanning social, economic, and cultural aspects of YP life through “Article Club”! 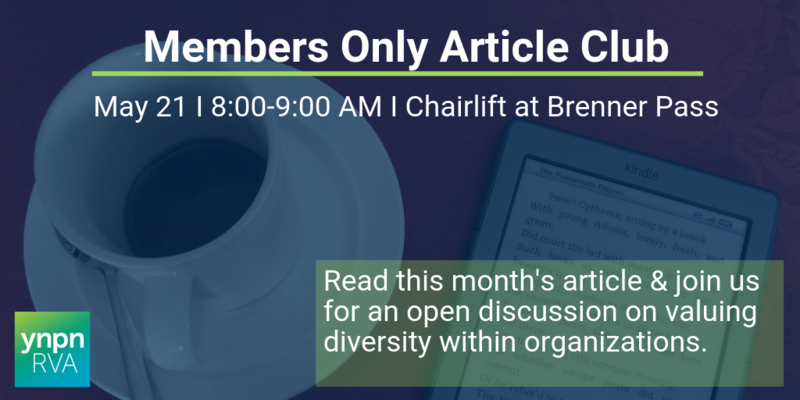 Read this month’s article and join us for an open discussion on valuing diversity within organizations. Maria Del Carmin Triana of Univ. of Wisconsin Madison and Maria Fernanda Garcia of Univ. of Texas El Paso examine if a reputation for racial discrimination causes people to think the processes used to make decisions in an organization as a whole are unfair. BRAND: Discuss ways to become an advocate for diversity as you move through your career. NETWORK: Get to know your fellow YNPN RVA members better during this open discussion. CAREER: Get insight into careers at local nonprofits by networking with fellow YNPN RVA members. BRING: An electronic or paper copy of the article for discussion.